Please enter your own testimonial for Mark Matteson by clicking here. I so enjoyed your presentations to the WIN group in Wichita. You are without a doubt one of the best speakers we have ever had. I picked up so much from your talks. New habits which I will incorporate into my daily actions along with Jim Stoval’s recommendation to write down 10 things we are thankful for each day in our journal. I’ve been doing that for months. Hope to see you again in the future. Thank you for all the prep and effort put into delivering excellent inspirational insight Mark. I appreciate you. I attended one of your training classes with one of our dealers a few months back. I am a Lennox Territory Manager that works in Washington DC. You & I did some role playing during the training, I was the guy that was a big golfer. From that training I took away a few nuggets that I started applying almost immediately. The impacts of these “nuggets” are sending ripples of change in every area of my life. I felt it was important I take a moment to share this with you. Daily Journal- this by far has been the most impactful. I have never kept a journal before and this has stretched me way out of my comfort zone. I am finding myself thinking differently and have noticed an immediate improvement in the way I approach everything. Thank you cards- I started sending “thank you” cards to every new prospect/dealer that I meet. The response I have been getting is incredible. This is helping me build relationships with people I have just met faster than I could have ever imagined. Your podcast- I subscribed to your podcast and find myself listening to it weekly. Now I feel like I have your voice running through my head when I run calls, this has consistently given me fresh ideas and keeps my focused on what I am doing well and need to improve on. The cd’s you gifted to me- You signed and gifted me 2 audio cd’s. I have listened to them at least 5 times each. I feel like I have listened to them so many times I feel like I own the material now in my mind. I enjoyed them so much I gave them to my Dad to listen to. He loves them. The one “nugget” I haven’t put in to play yet is devoting more time to reading daily. I see the value & have chugged your kool aid. This will be part of routine sooner than later. The brief time we spent together and things you have taught me are going to stick with me forever. THANK YOU for changing my life professionally/personally in a positive way. Many years from now I will look at back at my first journal entry and think of you. I am looking forward to the next time our paths cross. Mark – Excellent article – Sparkling Success! I totally share Bob’s thoughts on how you have come into our lives just when we needed to be inspired. You are excellent at what you do and you definitely help bring perspective and inspiration into our lives. 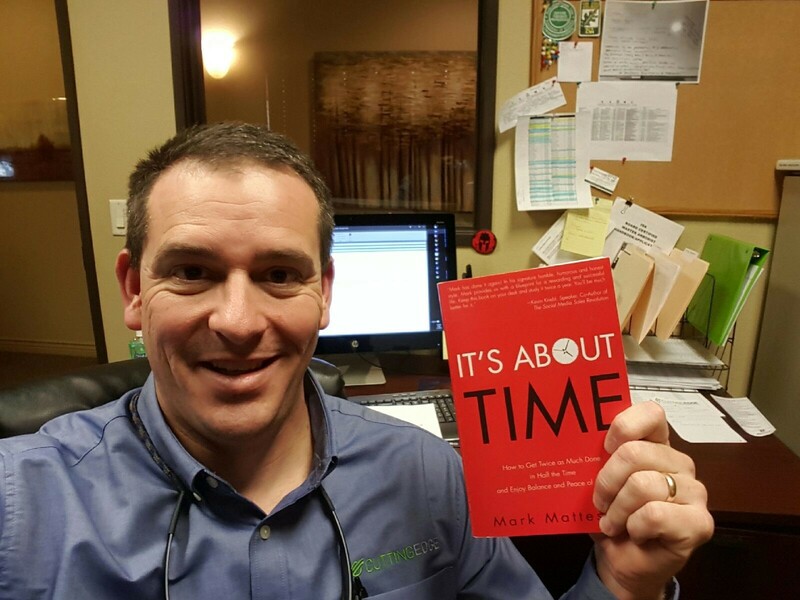 Mark Matteson consistently delivers a message about expressing appreciation for others (co-workers, customers, etc.). That approach resonates deeply with me, as I believe everyone needs to take on the mission to make their world a kinder and more thoughtful place. I recently returned from a dealer meetings in Michigan where I purchased 3 of your books on cd along with the one you gave me for coming on stage. I have listened to the first book in entirety freedom from fear. This book along with meeting you I feel will change my entire life. I am going to continue to listen to the rest your books and apply them to my life. You had a great impact on my life and I hope we stay in contact. Mark, I just want to say, You were amazing in Santa Rosa, Ca. You had me laughing and kind of had a big lump in my throat, from that last story you told us. I always wondered how people looked at me when I was the center of attention. Not only our stature are close being equal but our way of thinking and how we treat those around us are amazingly similar. When we were eating supper that night, I video'ed you from the other table. I showed the video to my wife, when I got home. I told her, I think I found my twin, in California. She laughed and said, Oh my lord, another one of you!!! After watching the video, she laughed again and said, yep!! He doesn't meet a stranger either. I hope I have another opportunity to come see you again!!! If you are ever in an open forum in Louisiana, please let me know. Keep up the GREAT work!!!! You are simply AMAZING!!!!!! Heard Mark speak this morning WOW! I laughed and I even cried he is so inspiration, I was totally blown away. Thank you so much. Thank you for making the whole room laugh and inspiring us with positive thoughts and good feelings! Pretty sure everyone walked out of there ready to take on the world after hearing you talk. Your presentation was definitely a big wow! Thank you to Mr. Mark Matteson for giving us an awesome presentation that I personally will never forget; hats off to you Mark! Thank you for your follow up from a great seminar. I am going to see to it that our time spent together improves our company. The people that get to experience your talks are very fortunate. You are a very good communicator. Thank you. It was SUCH A PLEASURE to finally meet you in person and get to spend some quality time with you! Thank you SO MUCH from the bottom of my heart for being there. YOU ROCK!! I must say, you were definitely the star of the conference without question! I received so many wonderful compliments about you. The feedback was overwhelmingly positive! I can’t thank you enough for introducing us to Mark Matteson. He is a game changer for anyone that aspires to higher achievement and success. Jim Whitescarver, President, Commercial Express HVAC, Inc. Wow!! I really enjoyed your talk on It’s About TIME! I have been listening to a lot of training and different things at work lately as it has been slow and this is by far one of the best. It will help me at my full time job and my Thirty One Business!!! I would love to receive your e-book on this! Thank you!!! I listened to your conference call and got some very good tips. Thank you! You had a great lecture and I enjoyed listening. I had my parents join in as well and possibly my brother and sisters. It was great to hear your voice and hopefully I will see you sometime soon! Your tele seminar was excellent thank you so much! I’d love to receive your eBook please. I need all the help I can get! My mind never stops day and night. I have so much passion to make my business a huge success, the only thing holding me back is myself for some reason. Why? I have no flippin idea! IT’S ABOUT TIME to reach my goals! Thank you so much, I really enjoyed listening to you. PS I know I used “I” way too much!! I’m requesting the E-book to share with my class. Awesome call! Great presentation. You captured so many insights from many great time managers. It was a wonderful review and it offered with a few changes I will make. I did not have a way to speak up when you asked who was listening in. I enjoyed your presentation tonight. I will look forward to reading your eBook. Thank you. You did a great job at the BOMA Symposium in Boise, ID. This past Tuesday. I shook your hand before the event got rolling, told you I had read your book. See attached photo for proof!